There are no photos with those IDs or post 1109 does not have any attached images! The Case Wood Museum combines the environmental relevance of this Natural Reserve of the Network Park, at the same time, Reserve of the Biosphere, with the no less relevant wood tradition, that far from undesirable forestry, has conscientiously respected its nature. The mountains continue as they did centuries ago and the presence of man is nothing superb. To better understand the merits of this council, you can approach the Park Interpretation Center, located in the capital Campo de Caso. From there, and with the necessary knowledge, we left for the village of Veneros, Ethnographic Ensemble, with more than one Asturian identity sign, among which the Museum of Wood. It was promoted by a neighborhood association and currently has a well-stocked collection of the most basic woods of the park and the whole of the Principality. Like the one in ash tree, very abundant, or the oak, mythological tree already venerated by the ancient druids; Brown o the beech, the latter with a large extension throughout Asturias. Approaching the Wood Museum provides us with more than one reward, such as learning to discern, from then on, which tree species we find along the way. Know also more precise aspects, such as a beech can reach 40 meters high and live 300 years. On the other hand we will discover the tools used in forestry work, as well as the most used tools in the area for carpentry and joinery, including the artisan manufacture of madreñas, of which Caso is a maximum exponent in the Principality. In times of splendor I had about a hundred artisans and a good number of indirect and parallel works to this performance. Discuss "Madreñes" it is to speak of a culture, like the rural one, that in Asturias lived for decades with unpaved roads, and puddled caleyas that required an indigenous footwear that solved the question of walking without getting too busy. The mothers hold a prominent place in the aforementioned Veneros Wood Museum. There are of all kinds and conditions, as well as of all the places of the world, mainly of the Cantabrian Spain and continental Europe. In the background they look like the Central European wooden clogs, but they gain in height and adaptation to the environment, since they have a heel and two front cleats to improve the isolation of moisture and mud. Basically there are two models, the narrowest and closed for feet embedded in "calcetos" (fat socks), or those that are made for feet that are previously introduced in a shoe. On the other hand, they come to discover some more or less sophisticated and aesthetic, such as mothers with attached heels, removable, that the girls fit to attend the parties and gain a few inches in height. The mothers were the footwear of generations and rural generations, and the madreñeros, their craftsmen, only began to be scarce with the appearance of another type of footwear of rubber, impermeable and cheaper. 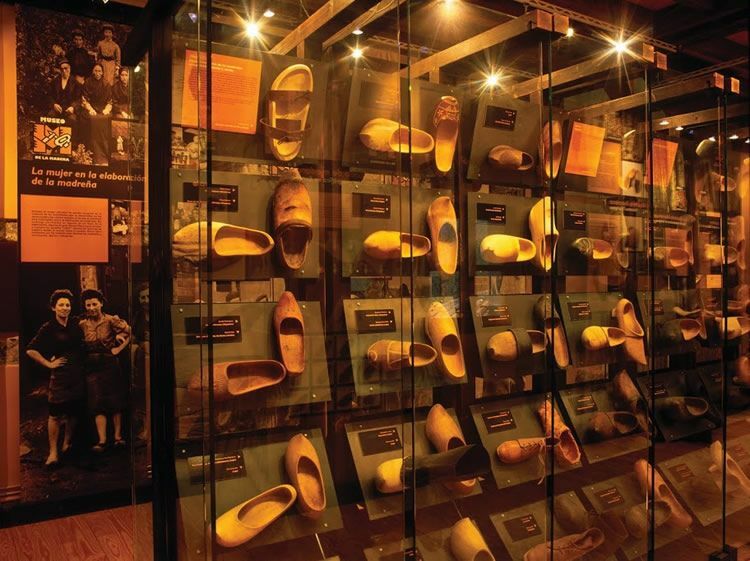 In any case many are those who habitually continue wearing these clogs, and there are many who by romanticism or nostalgia even collect them in the most unsuspected places of Asturias and the Peninsula. And is that a mother is not anything. He knows it well Luis Testón Lozano, that to his 54 years is one of the people that still makes this art survive. In its Workshop of the Mother of the village of Pendones (a complementary center to the Museum of the Wood) we learn many more things of this noble work and we feel admired by the skill with which it is executed. Luis tells us that the first generation of mothers and daughters of record is from 1770-1780, although he asserts, like many other connoisseurs of rural history, that this trade goes back many more decades, given its extreme functionality for the rural nuclei. The municipality of Caso is a reference point of what has now become a select crafts that is in danger of extinction. Teston take the "hachu" and eye is shaping the trunk to shape the mother. Be part of a thin beech trunk, more excatamente the lower part of the tree to be harder. At the end of the process the pair is symmetrical and can be shod by an exact foot number 36, 37, 38, 42. Luis says that In this work, "you have to be more careful than a surgeon of the heart". And it does not lack reason, because seeing as the splinters are falling of capricious form it is difficult to believe that there has not been an error of calculation that gives the fret with the work. The last phases of the elaboration are, if possible, more precious. From the hachu is passed to the adze, which allows greater control in fine work. The drill is then used to make the hole in the foot. On the outside it is finished polishing the clog with tools such as the Llegre, the scrape, the brush and a lot of pulse. Finally the madreña can be varnished or smoked with broom smoke, it is practiced slits with dexterity that in the end form a drawing of mainly floral motifs, and then rubbed with a piece of tocín (homemade bacon). Ready to show off without complexes. Formerly Case supplied the Asturian market with some 50.000 pairs of mothers per year. Currently, this craft is almost a cult, and footwear itself, more than a market product, is now a relic of pure Asturian wood, very pleasant to the touch. If you have the chance, do not miss this magnificent opportunity to get to know this trade in situ, or what is the same: an interrelated culture and nature that have managed to remain faithful to themselves by supporting one another. Contact numbers: 985 60 80 97 and 985 60 80 02 (City Hall). 3 answers to "The Mother's Workshop"